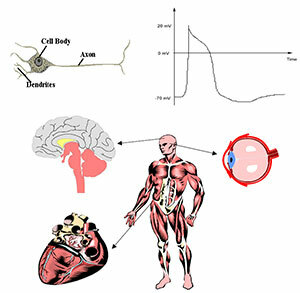 Basic Physiology introduces students to different biopotentials produced by the body and learn how to record these signals. Electrode setup and placement, skin preparation and methods of filtering out sources of noise, such as 60Hz or motion artifact, are also taught. An introduction of human biopotentials is provided and concepts such as ionic currents, the Hodgkin-Huxley model of the giant squid axon, resting and active ion channels and Nernst’s potential are described. Students also learn how different types of electrodes are used to measure biopotentials using the BioRadio. The electrocardiogram (ECG) signal is introduced along with the basic structures responsible for cardiac potentials such as the SA node, the AV node and Purkinje fibers. 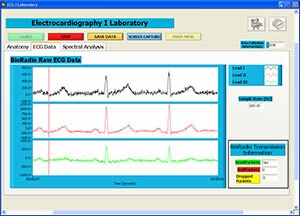 The P, QRS and T wave components are discussed and students record a standard 3-lead ECG signal. Signal processing involves Einthoven’s triangle and mean cardiac vector. Electroencephalography (EEG) is introduced along with brain anatomy, topographical organization and the origin of the signal. Proper electrode placement and is discussed. 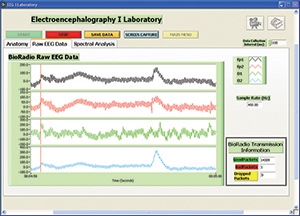 Alpha, bet, theta and delta wave characteristics are differentiated from 4 channels of EEG collected from the student. The basis of skeletal muscle contraction, from neurotransmitter release through insertion of the myosin head, is used to introduce electromyography (EMG). 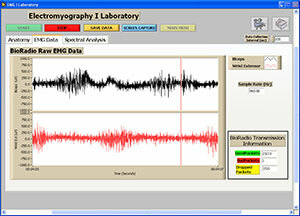 Students record EMG signals and determine the relation of the output force and how fatigue affects the signal. 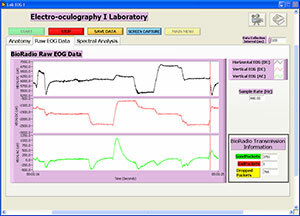 Eye anatomy and function is learned through recording of the electro-oculogram (EOG). The EOG signal is examined to detect blinks and eye movement, such as saccades, vergence, vestibular and smooth pursuit. 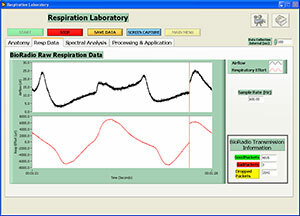 A nasal/oral thermocouple and respiratory effort belt are used to introduce respiratory measurements. Signals are filtered and analyzed in the time and frequency domains and the sensors are used to determine the proper method of calculating breathing rate.